The area around Kilmartin in Argyllshire, north of Lochgilphead on the road to Oban, is steeped in pre-history, with ancient standing stones, stone circles, 5,000 year-old burial cairns, the site of a Dalriadic fort on top of a high hill and Kilmartin Museum which won the Scottish Museum of the Year Award in 1998. The Nether Largie South cairn contained Neolithic pottery when it was excavated in the 19th century and the standing stones nearby (originally 22 stones of which 13 survive) have "cup and ring" carvings. Some historians believe they were used for astronomical observations 3,000 years ago. Close by is the Temple Wood stone circles and a few miles to the south are seven standing stones, a cairn and a henge (circular bank of earth with a ditch) at Ballymeanoch. Kilmartin church has an excellent collection of medieval carved stone grave-slabs (see illustration of one of these on the right). To find all these sites (and others in the area) it is advisable to buy a guide book from the museum. The isolated rocky crag at Dunadd, a few miles from Kilmartin, was the ancient capital of Dalriada which was established by immigrants from Ireland around 500AD but a defensible outcrop such as this was probably used in earlier times too. 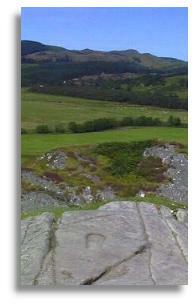 A rock carving, Ogham Writing and the outline of a footprint (visible in the illustration here) on a rock near the summit suggest that it may have been the site where the Kings of Dalriada were crowned. The top of the hill is accessed by a steep path and is not recommended unless you are reasonably fit and agile. The Argyll and the Isles Tourist Board covers Oban and Lorne and on other Web sites you can find out more at Argyll on Line and Oban and North Argyll. The site covering the Mull of Kintyre describes the area as "the nearest place to nowhere and the furthest from anywhere." 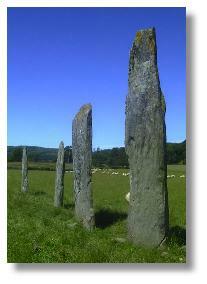 The Kilmartin Museum site has a comprehensive site on 150 of the Kilmartin Monuments.